Crows are members of the genus Corvus in the family Corvidae; Corvidae also contains the many genera and species of jays, to which crows are closely related. While the common crow (Corvus brachyrhynchos) may be the species most commonly associated with the genus, other members include the ravens, rooks and other crow species. Most species in the genus Corvus are black, although iridescent blues and purples are visible on a few, along with large patches of white on species including the pied crow. Even the normally all-black American crow may show white markings or be completely white. 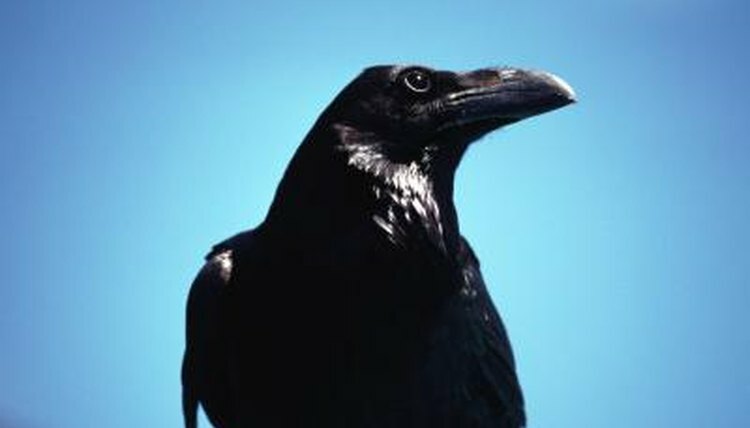 The various crow species range from only well under 1 pound to the particularly large common raven (Corvus corax), which can weigh well over 3 pounds. The American crow prefers a habitat that has a large, open area with nearby trees for roosting. Ideal locations include farmland or grassland bordered by a forest. In addition, these adaptable birds are at home in suburban and urban areas. The common raven, on the other hand, prefers to stick to treeless landscapes include rocky cliffs, plains, deserts and sparsely dense forests. Northwestern crows (Corvus caurinus) prefer coastal areas near forests, but not necessarily in them. On the Cornell Lab of Ornithology's "Frequently Asked Questions About Crows" page, which is maintained by Dr. Kevin J. McGowan, the answer to "What do crows eat?" is a simple "everything." American crows are omnivorous, feeding on large amounts of fruits, grains and nuts in addition to young mammals and birds, amphibians, reptiles and invertebrates. Carrion is also on the menu for these common backyard visitors. The same diet is common among the species in the genus. Many members of the crow family show certain degrees of both positive and negative economic importance. Because of their varied diets, many species can damage agricultural crops and gardens. On the other hand, they also eat carrion, which helps out not only humans, but their entire ecosystem. Cornell Lab of Ornithology: White Crows? Is a Rhinoceros or Hippopotamus Heavier? For How Long Do Lovebirds Live? What Kind of Habitat Do Sparrows Live In? What Do Monkeys Usually Weigh?